Home > Latter-day Saint Blog Posts > Video: Can I Go Inside a Latter-day Saint Temple? 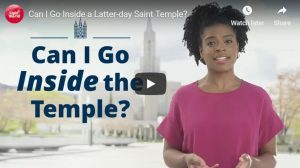 In a new video, “Can I Go Inside a Latter-day Saint Temple?” the Church of Jesus Christ of Latter-day Saints provides an overview of temples. Members of the Church believe temples are the most holy places on earth. When a temple is first built, there is an open house and anyone can go inside. Afterward, only Latter-day Saints can enter. You can learn more about Latter-day Saint temples in Gospel Topics. LDS365 : Video: Can I Go Inside a Latter-day Saint Temple?